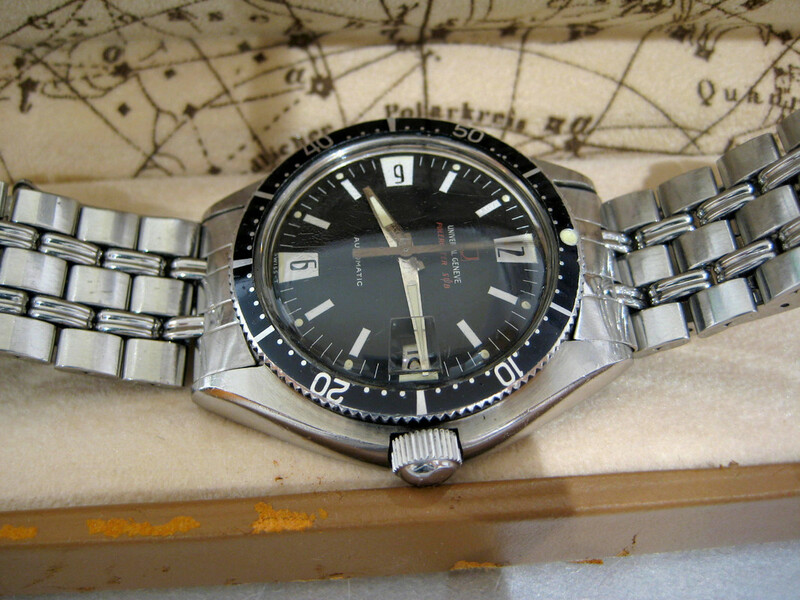 The Universal Geneve Polerouter Sub was introduced in 1961 and was produced through 1968. 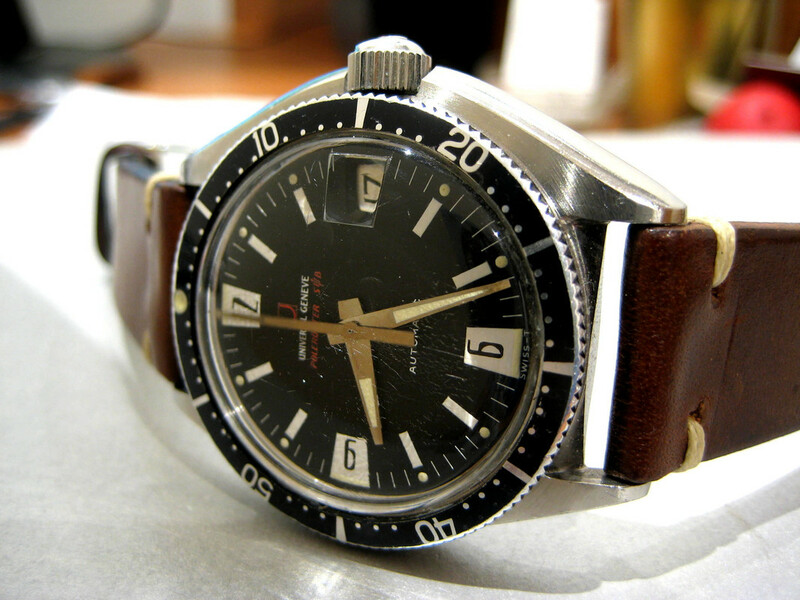 Famous watch designer Gerald Genta engineered the dress version of the Universal Geneve Polerouter in 1954, and it was introduced in 1955. 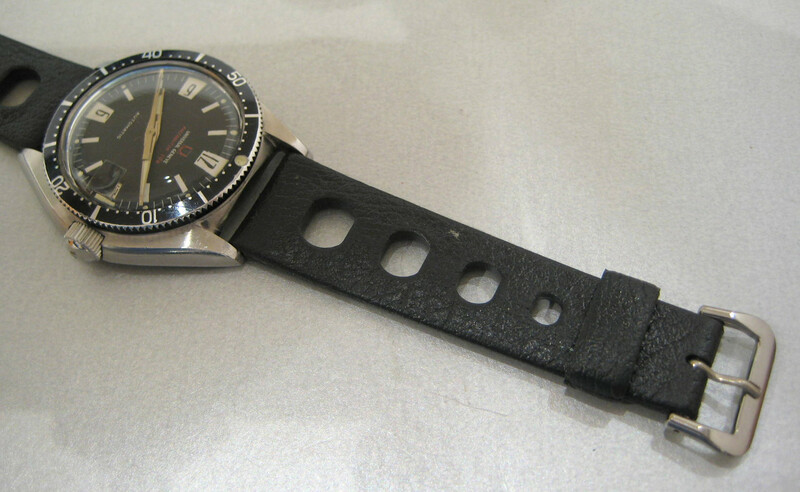 It was originally named the "Polarouter," and was worn by SAS airline crews flying over the North Pole, who needed strong anti-magnetic protection in their wristwatches. 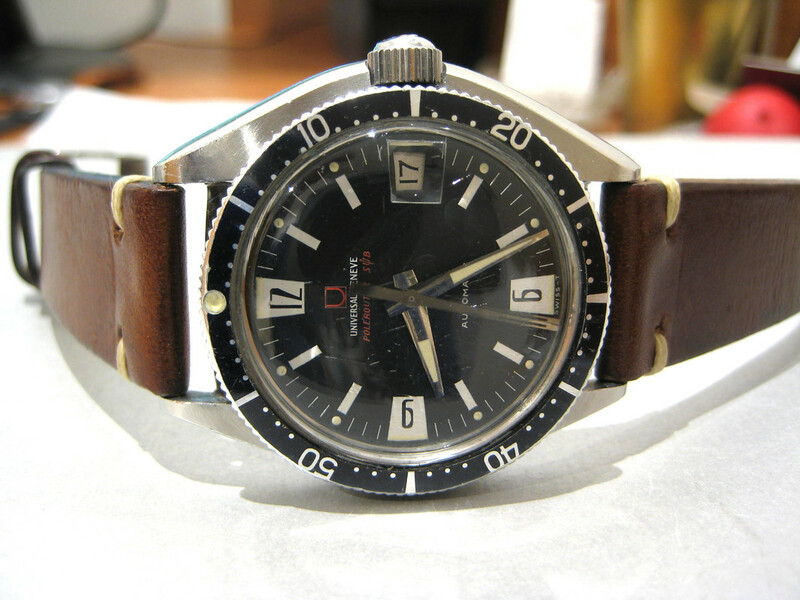 This specific Universal Geneve Polerouter Sub is a highly collectible beautifully well-maintained piece of history, remaining 100% original. 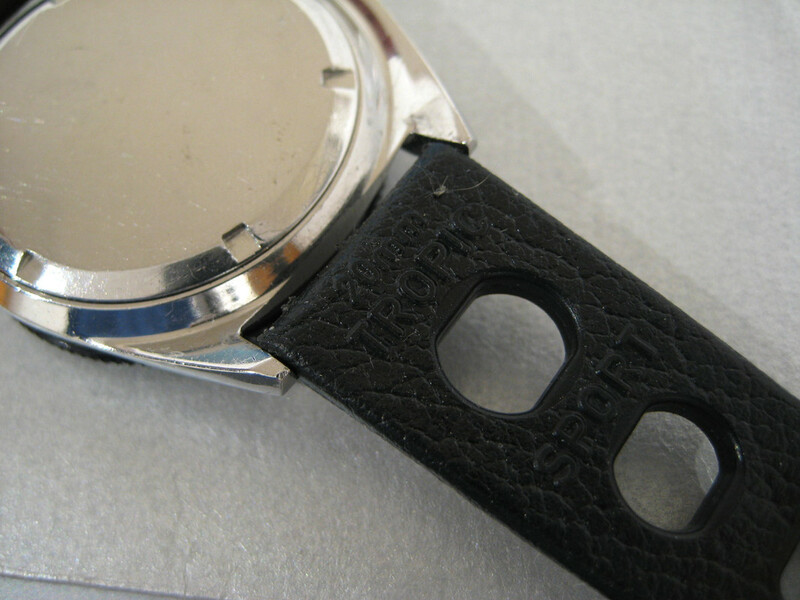 There is a screw-down crown protected by case-guard shoulders, and a solid screw-down case back. 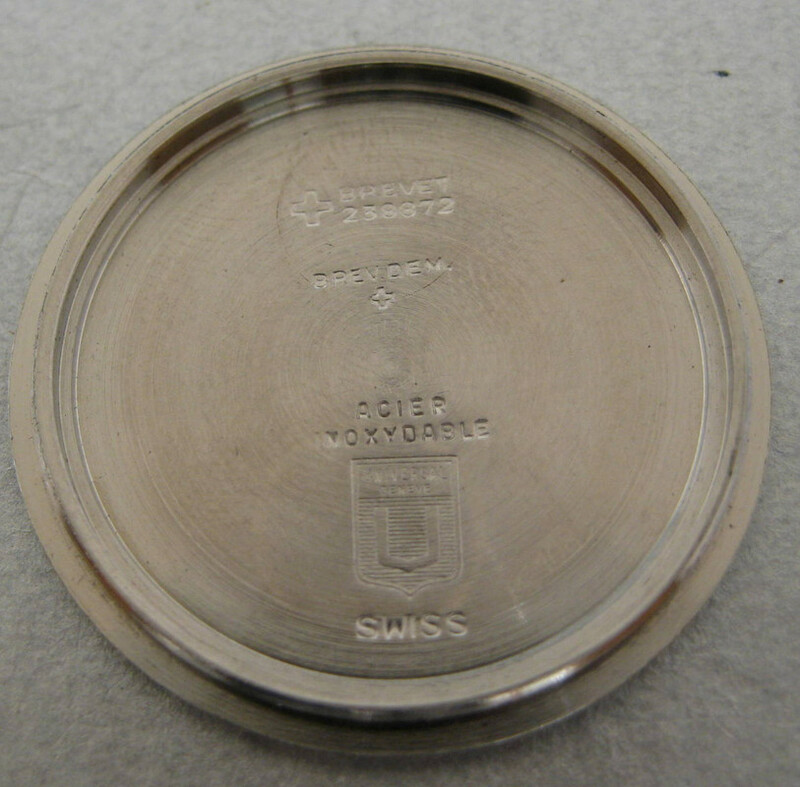 The inner case is antimagnetic and is signed with hallmarks. 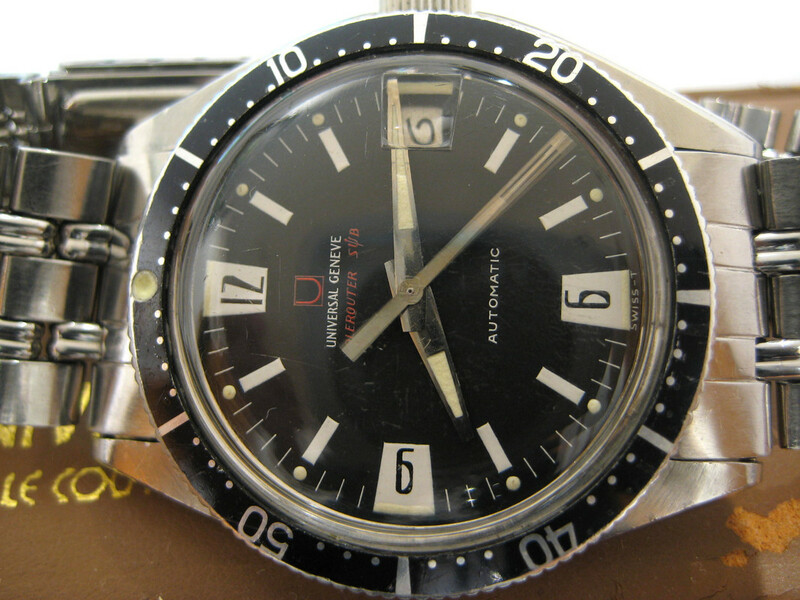 The asymmetrical case seems to retain factory finishing and is on very very good condition for its age. 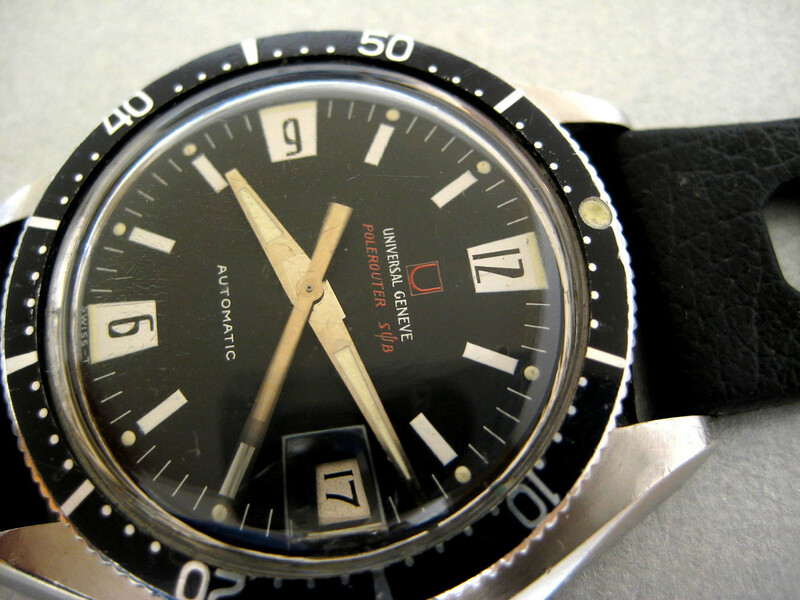 The bezel retains it's original pearl and remains in excellent vintage condition showing almost no wear. 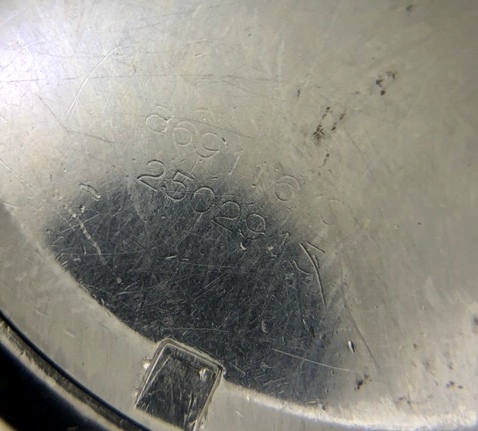 The case retains the original crystal with the correct hallmark in the center and is showing light crazing. 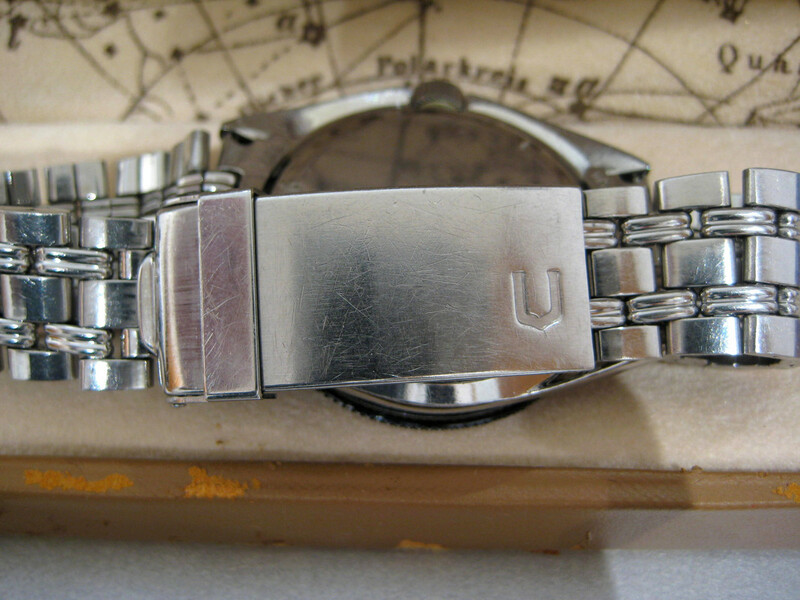 The crown is also original showing the signed U on the crown. 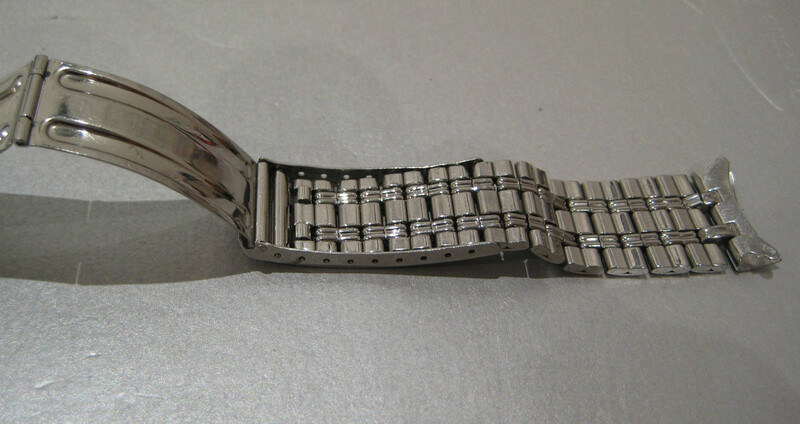 Watch comes supplied with rare Gay Frères bracelet with UM end links dated 1967, an original Tropic strap with original Tropic buckle and a vintage leather strap. 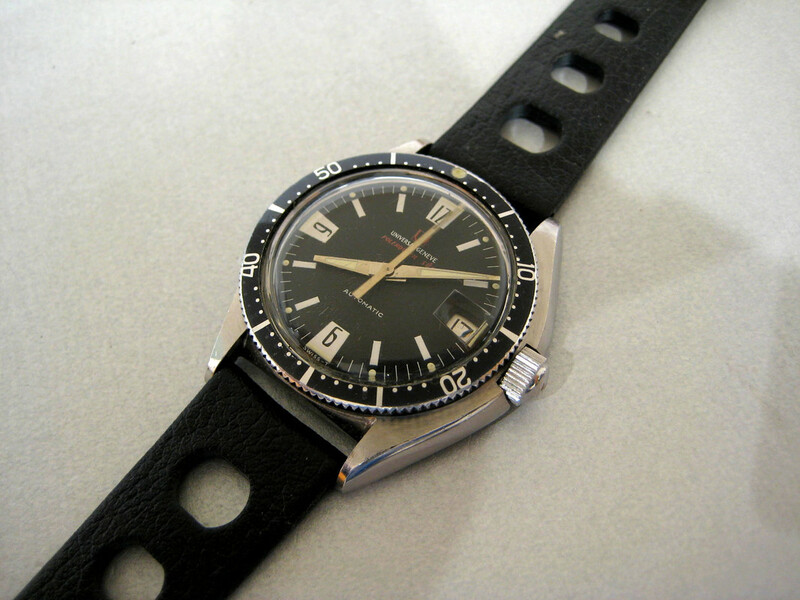 The matte black dial remains in excellent vintage condition. 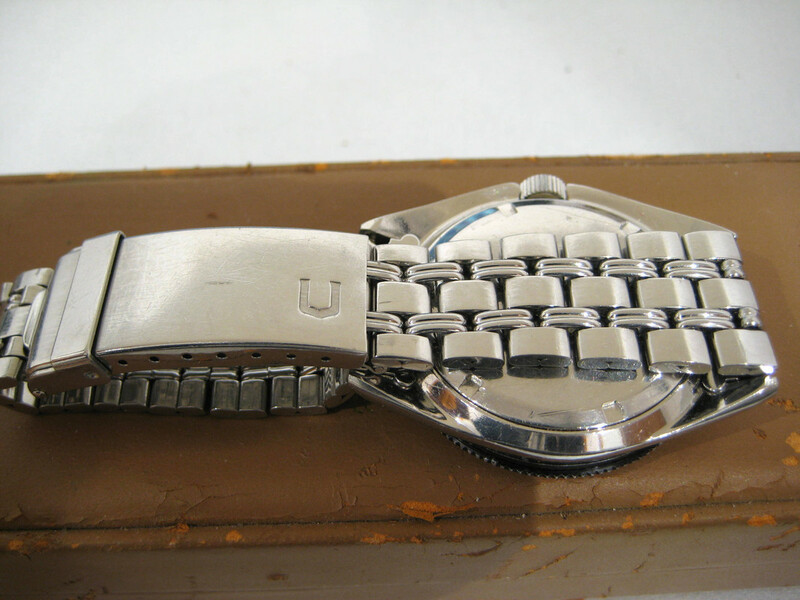 The "art deco" numerals have a classic vintage aesthetic. 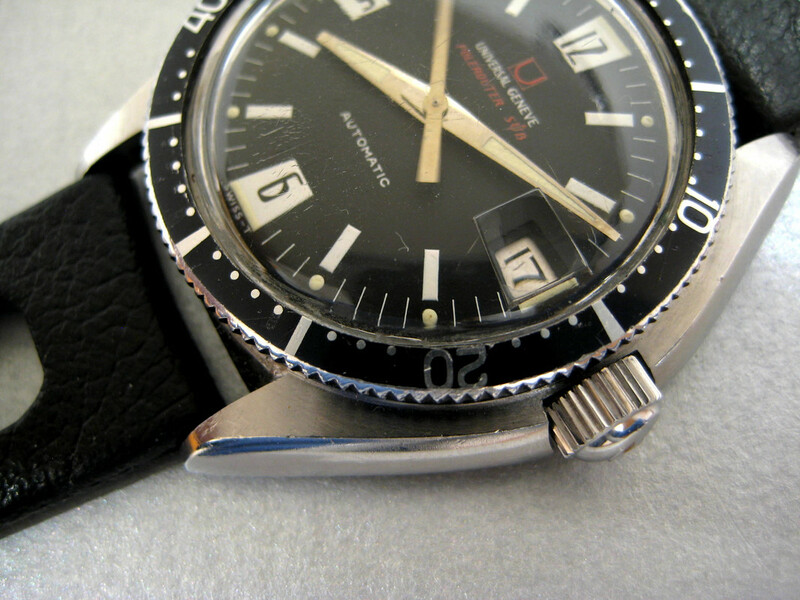 The lume plots are fully intact and have achieved a charming golden patina. 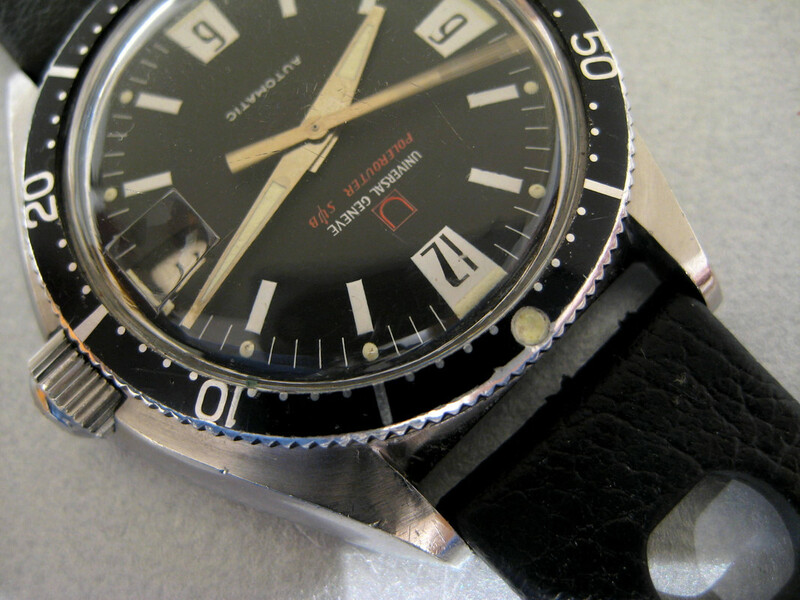 The original hands remain in excellent condition and although a touch lighter in coloration is is a common occurrence with early Polerouter Sub's. 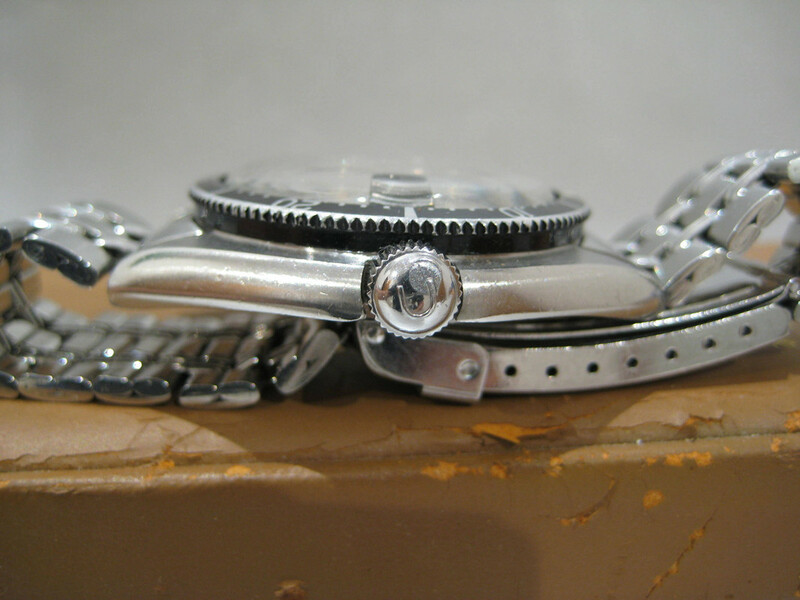 The watch retains the original date wheel featuring art deco numerals as well. 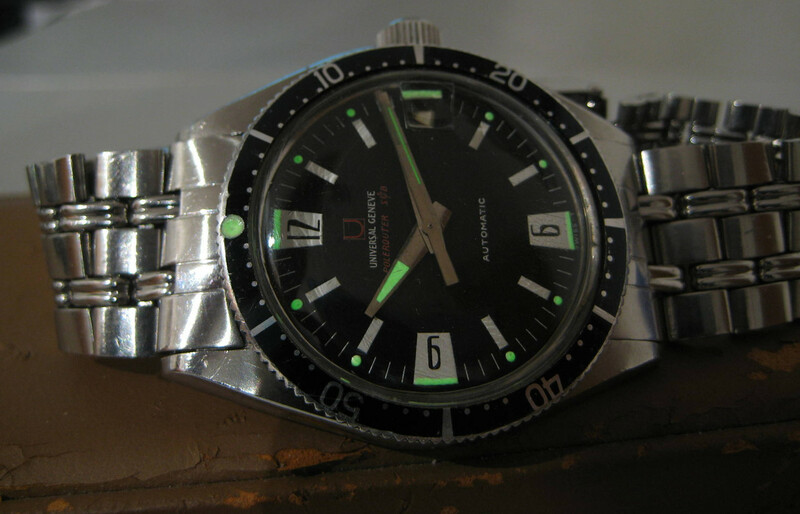 Both the lume on the dial and the hands remain fully intact showing zero lume degradation when viewed under U.V. light. 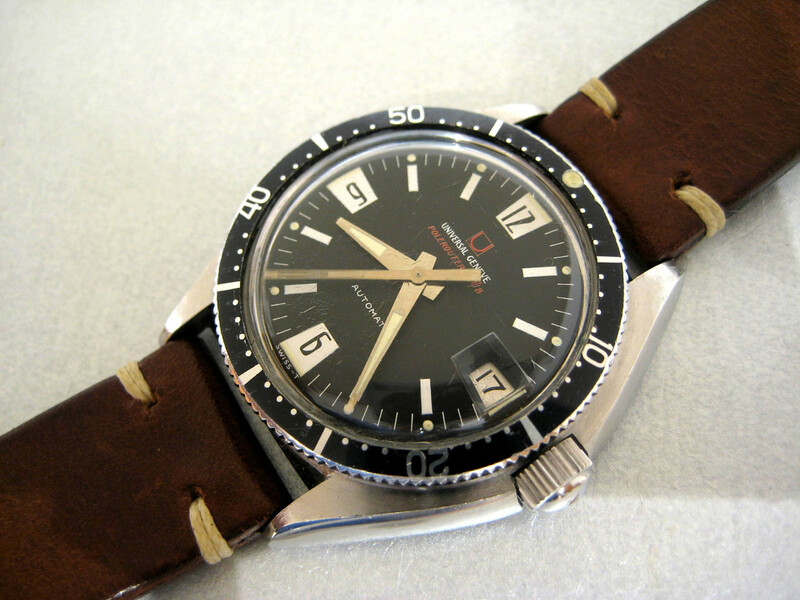 This Universal Geneve Polerouter Sub 869116/01 has a mechanical automatic self-winding Universal Geneve Caliber 69 movement. It's rhodium-plated with fausses cotes embellishment, and it's constructed with 17 jewels, an Incabloc shock absorber, and a straight-line lever escapement. 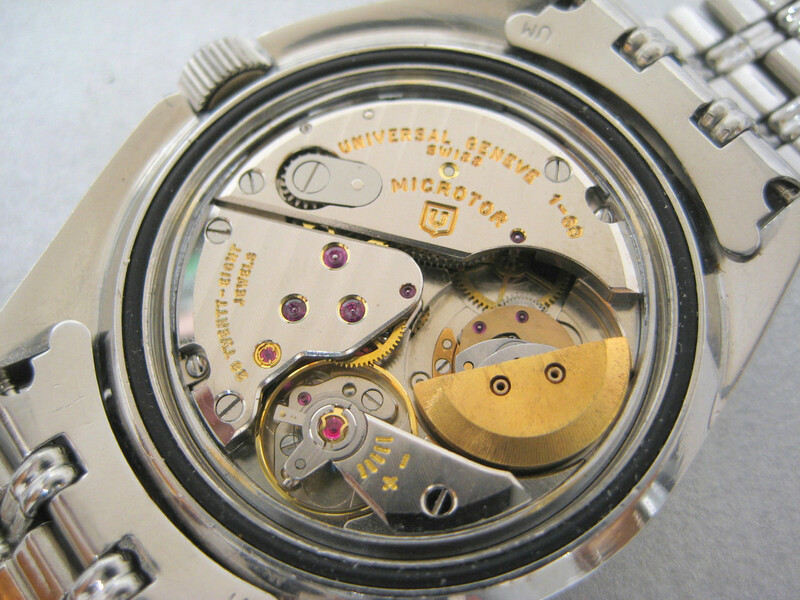 It includes a monometallic balance, a self-compensating flat balance spring, and a gold micro rotor. 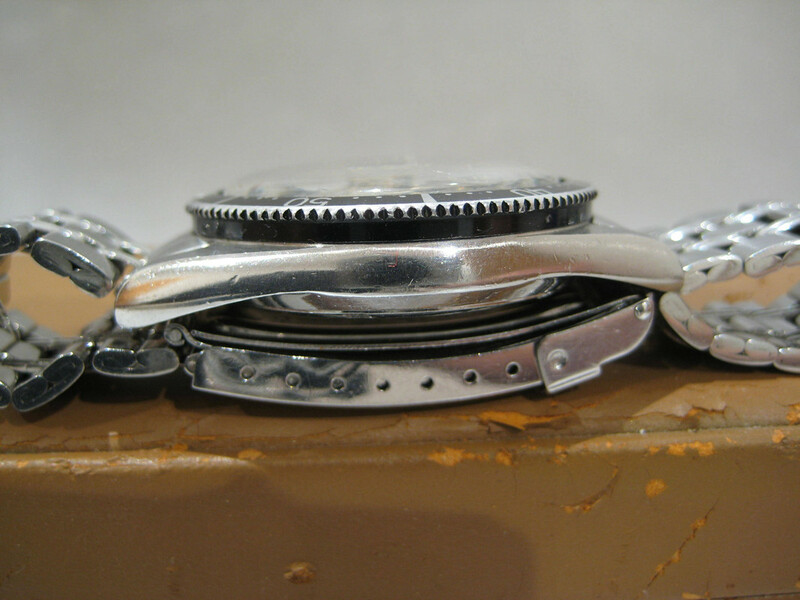 The mechanism oscillates at a frequency of 18,000 vph (2.5Hz). 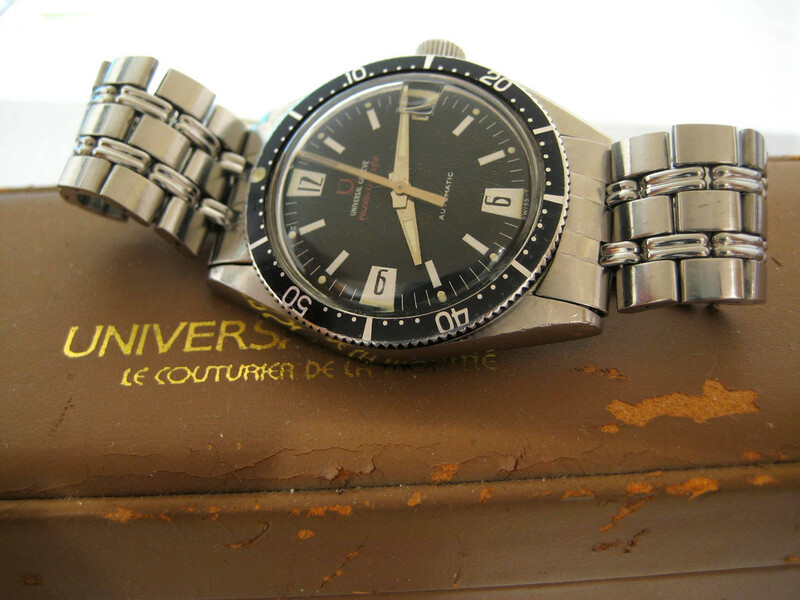 Comes with its Universal Geneve box.